Can’t wait to bring Skye back for a visit once she is harness trained. Thanks again Birds N All for bringing this wonderful bird into our life’s. A big thank you for our Blue and Gold Macaw. We have named him Escobar. Because of your much needed assistance in helping us on how to raise him Escobar has become a quick learner. He is now harness trained which he took to without stress. He loves to go outside bushwalking and loves rides in the car. He is very affectionate and loves to lie down on the lounge with us and preen and snuggle. He has taken a fancy to our cat Cassee with nose to beak greetings, but most of all he loves to bathe in the rain when he wags his tail feathers and squawks loudly (which we love). He then comes inside and dries off in front of the heater. I hope you are keeping well. Indie has no doubt been the best thing I have ever bought I love her so much and she has brought so much joy and happiness to this house. She has learnt to say "hello" , "I love you", "What you doing" which she learnt from my lorikeet lol.. She is just adorable and likes to be with me where ever she can, she helps me to feed the roos by sitting on my arm whilst I am giving them the bottles. Thank you once again for letting me buy her she is my baby and she knows it. I hope you enjoy the photos. Would like to take the time to thank you for taking the birds and making the process of selling them easy and non-stressful for us. You both removed a huge stress load that was upon us. We both thank you for this. We truly would not go anywhere else for Quality. Your birds are the best in the West. Thank you for your years of friendship, I'll be continuing to recommend the both of you to anybody who wishes to purchase birds. Just want to thank you and Ray for my purchase of MAX, I have owned birds for a number of years now and also bought a red tail from you back in 2009. I have always wanted a Blue & Gold Macaw and this year is my 50th birthday so my wife bought me one, MAX is a fantastic bird and he transitioned very well from your home to ours up in the Perth hills. MAX is now 8 months old and as you can see is a part of the family, he has managed to speak about 5 words now, and when the vacuum comes out, he competes with it to see who can make the most noise. I just want to thank you and all the staff at Birds n All for your fantastic support in owning one of these magnificent animals. 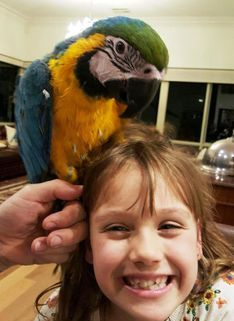 We have had Rastas, our blue and gold Macaw, for just over a year now and can't imagine family life without him. As first time bird owners we relied on Geoff and Ray for their advice and support. Nothing was too much trouble in handing him over and they were available for questions and suggestions after we had him home. Rastas is a beautiful boy, full of character and with a growing vocabulary! We cannot recommend Geoff, Ray and the team highly enough. 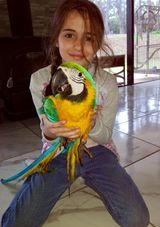 I recently bought my Blue and Gold Macaw “Indie” from Birds n All. I have never experienced such an easy and experienced sale of any animal in all my life. I run Kangaroo Haven in Kununurra and have bought many birds before but this has been the best buy yet. I usually take in orphaned and injured wildlife but have always wanted a Macaw. I did my research and found Birds n All. I spoke to Geoff and he explained to me all about the Macaw. I travelled to Perth In January after paying my deposit for a female Blue and Gold Macaw and Geoff very kindly took the two baby Macaws to the shop in Caversham so I could meet them. I totally fell in love with them especially one and Geoff said I think that is the female and he was right after having her DNA tested. (This bloke has such good experience). He gets to come out of the cage for hours and hours every day and is as cheeky as ever! Thanks again for rearing such an amazing bird! 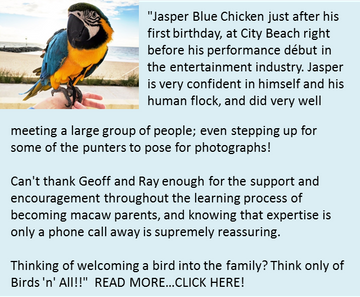 "Jasper Blue Chicken just after his first birthday, at City Beach right before his performance début in the entertainment industry. Jasper is very confident in himself and his human flock, and did very well meeting a large group of people; even stepping up for some of the punters to pose for photographs! Can't thank Geoff and Ray enough for the support and encouragement throughout the learning process of becoming macaw parents, and knowing that expertise is only a phone call away is supremely reassuring. Thinking of welcoming a bird into the family? Think only of Birds 'n' All!!" Hi, I recently purchased the hand reared galah that was in the shop for a little bit, she (just a guess) is so special! She has settled in so well already and loves exploring her cage and my caravan that I stay in. Thank you to everyone that helped and gave me great advice, I'm more than happy with her!! I was wondering if you knew when or when about her birthday would be? just to make sure we can celebrate? Thank you so much for our beautiful grand Eclectus named Chunk. We appreciate your time effort & expert knowledge as we now have an awesome hand raised ecky which is all thanks to Geoff & Ray. Thanks Geoff and Ray for selling us Archebald "Archie" the blue and gold macaw. He has settled in well to our home and has become good friends with Charlie our 60kg newfoundland, as well as all the neighbour's kids! Peta and I can't praise the team at Birds n All enough for putting up with all our questions prior to purchasing Archie. Thanks again! Marie Herd - We got our weiro from Birds N All about 4 years ago. They were great service then, and have continued to provide excellent service since then, with a few visits back there and tips/advice. Lots of beautiful birds. Wayne Butler - The beautiful birds. The cleanliness. A little piece of heaven. Nicole Gray - After recently making the decision to purchase a bird in the near future for my partner and myself, I stumbled across the Birds 'N' All website and noticed all of the great reviews. Today we went to have a look and found out they definitely weren't wrong!!! The place is FANTASTIC! Lots of Large clean aviaries! All of the Birds were healthy and happy looking and obviously well cared for! It was more like a relaxing Bird Sanctuary than a business. The staff are very friendly and offer great customer service and the birds are well priced! We went there unsure on exactly what type of bird would be right for us but after meeting Geoff and asking him many questions; he gave us excellent advice and heaps of information on the breeds we were considering. We walked away knowing exactly what we want (An Eclectus) and when we are ready to buy that Birds 'n' All is the best place to go through to purchase him! Geoff and Ray obviously know their stuff and have built a fantastic business! We highly recommend anyone wanting to purchase a bird or bird products to go and see them! Thank you for all of the great advice and we will be visiting again very soon! Ashlee Camarda - My favourite place to retreat to. Brooke is super friendly and a great person, I haven't really had any dealings with other staff but they are also friendly and kind!! Amanda Jane Freeman - Like a little tropical paradise. I love to meander through and look at all the birds. Beautiful and clean. friendly, helpful people. 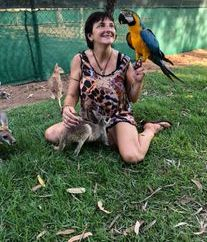 Maureen MacDonald - I haven't been to Birds N All as I live in Geraldton - Have spoken to Geoff and Ray and Brooke - Wonderful Helpful Kind and Caring people. Very passionate about their birds. 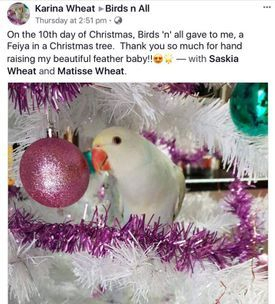 Shirley Tosevski - Naturopath - Geoff & Ray are the best in the Avian industry. They welcome visitors and always ready to give advice. The staff are friendly and the birds are of high quality. 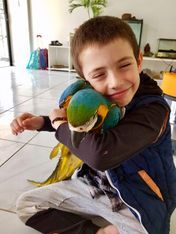 Over the past few year's and recently of my breeding macaws I have had contact with GEOFF D'CRUZ ~ BIRDS N ALL ~ PERTH WA Many people own and operate pet shops ~ However ! Some stand out far more than others. Geoff's natural Love, Care & Total dedication to these birds is his priority. I personally know how Geoff treat's his birds and recommend anyone wanting birds to visit his shop ~ and they won't be disappointed. I've been wanting a budgie for about 3 years, as I had researched every little corner about budgies that there was to find, and I found out that breeders were the first to go to to buy a healthy bird, so I looked it up on Google, and first thing that came up was Birds 'n' all. I bought my hand-reared budgie which I called Sparta on the 18th of December 2011, and we have already created a bond. When I bought Sparta, I was impressed by the staff's knowledge of birds, and there was nothing that the man said that I disagreed with. Soon, I'll be back for a better cage (I have a second hand carry cage at the moment) and then Sparta will be the happiest Budgie in the world :) Thank you to everyone who works in Birds 'n' all, you just made Bird buying a whole lot easier and more worthwhile. To anyone who has any doubts, wipe them away, when your at Birds 'n' all, they'll make your day. Birds n' All impressed me with the professional operation they run, specialising in meeting the end to end needs of anyone who may prefer a bird for a pet. 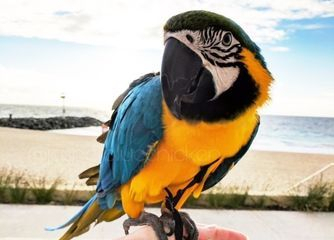 I would like to thank Geoff, Ray and Danny who assisted me with the journey in selecting and preparing me for my purchase of a baby Blue and Gold Macaw. I found Birds n All on the internet and had been searching for a while for a good avarian one stop shop. I was very pleased that indeed they had a great selection of healthy birds and avarian supplies. The service and knowledge was fantastic and I will definitely be back and recommend anyone to this establishment, thank you.